Just six years after the opening of the new school in Bastress, the congregation was honored with a visit from the foundress of the Sisters of Christian Charity, Blessed Mother Pauline von Mallinckrodt. On July 13, 1880, she arrived in the accompany of Sister Chrisostoma, to the pealing of the church bells. She was met some miles from the church by men on horse­back and children with flowers and led in procession to the convent. A placard was held by the lead horsemen which read: "Aus der Heimat vertrieben zu unsered Wool," (exiled from home for our benefit). This refers to the Nuns being prohibited from teaching in the German schools due to the "Kulturkampf," which began in 1871 under the regime of Chancellor Otto von Bismark. Blessed Mother Pauline left on July 16th, after spending a few enjoy­able days in the valley. One might speculate that had it not been for Bismark's "Kulturk­ampf," we would not be blessed with the presence of the Sister's of Chris­tian Charity. Mother Pauline had to find new positions for her Nuns and in April of 1873 the first Sisters came to America to take charge of a New Orleans school. Mother Pauline herself came to America in June of 1873 to investigate new fields of endeavor for her charges. It was probably at this time that arrangements were made for the Sisters to come to Bastress the following year. 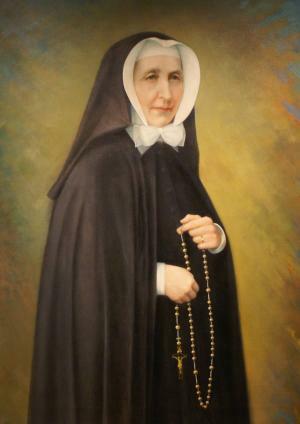 Mother Pauline's visit to North America, which resulted in her visit to Bastress, started on October 1, 1879, when she set sail for a visit to Chile. The voyage was extremely difficult, and was more so due to her poor health at the time. Mother left Chile for North America on February 19, 1880 and that trip was even more difficult than the one to Chile. She reached the New York Harbor with Sister Chrisustoma on Good Friday, March 26, 1880. She visited twenty-six convents, including Bastress, before leaving for the thirteen-day voyage home on August 21st, thirty-one years after the founding of the Congregation. We look forward to the day when we can refer to this remarkable woman as "Saint Pauline von Mallinckrodt."